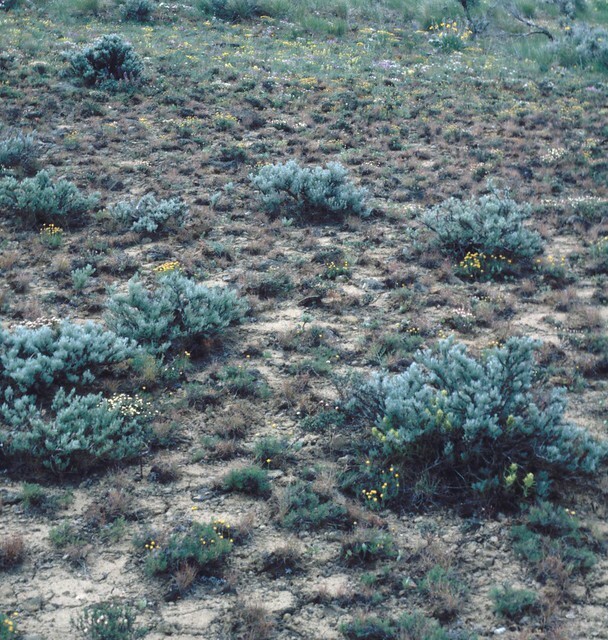 Stiff sagebrush is a low mounding shrub, strongly scented with the characteristic sage odor. It is low and spreading with a conspicuously woody base. The base is often heaved from the soil by frost action. The trunk is very irregular, spreading above the base in a dense cluster of short, rigid, and rather brittle branches up to sixteen inches in length. It grows up to two feet tall in dry rocky and thin soil steppe lands, where it becomes the dominant species. Stiff sagebrush stems are woody, yellowish, and hairy when young, becoming gray and shredded with age. The deciduous leaves are one half to one and a half inches long, wider at the tip, and divided into three to five narrow lobes and are covered with silvery white dense short hairs. The white and inconspicuous flowers bloom in summer. All sagebrush is wind pollinated, and the seeds are very small. Most seed falls beneath the plant and the plant community moves three feet or less per generation. Stiff sagebrush is of high value to wildlife because they are commonly found along exposed ridges where snowmelt occurs rapidly, and they supply the only available forage to big game animals in the early spring months. Western sage-grouse also feed from stiff sagebrush.